In TRACKS we saw Deathlok make his TV debut now we get to see Lorelei. What was Lorelei's true mission on Earth? What is Asgardian Artifact that Sif is Holding? Lorelei is the sister of the Enchantress. I would say the Enchantress is an A/B level villain and Lorelei is more of a C/D level character. Not a big gun perse but really she is the type of character that the show can play with. You never know what could happen in a show like this. Many people forget that Harley Quinn began on the animated Batman series as nothing more than a throw way accomplice of the Joker. She had no comicbook history at all. The character became so popular on the show that she is now comicbook A lister. So you never know. Lorelei could be brought out in such away that she becames a favorite reoccuring character on AoS and her status is raised in all mediums. Lorelei comes into conflict with others in the comics in that she loves Thor. She is Thor's crazy magical stalker that is willing to go to extreme lengths to get the god of thunder to pay attention to her and love her back. She is a part time lover of Loki. They tend to use each other, usually Loki uses her. Lorelei using a magic love potion in one story line is able to control Thor. She is fairly risque character. After gaining control of Thor using the magic mead, he catches her in the bedroom with Loki. She believes that even though this makes him angry, that the potion will still let her control him. However, Thor's fury effectively breaks the potions hold on him. Thor does not like to share. A three way love triangle in comic book? NEVER! 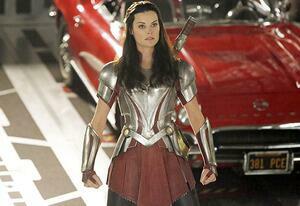 So the question remains what will Lorelei be after on earth and why is Lady Sif the one hunting her down? Maybe she is going seduce Caulson to get free tickets to Tahitti. I do not know but it should be a lot of fun.